RIO DE JANEIRO (CNS) — Visiting one of this city’s notorious “favelas,” or slums, Pope Francis denounced corruption and a “culture of selfishness and individualism,” and called for a “culture of solidarity” in pursuit of social justice. The July 25 speech was the pope’s first major statement on social and economic questions during his visit to Brazil, a country that has enjoyed years of strong economic growth but is currently in turmoil over widespread dissatisfaction with government policies. The pope arrived at the Rio neighborhood of Varginha just before 11 a.m. and began his visit with a short ceremony in the small neighborhood chapel, where he blessed the altar before a congregation of more than 100 people. 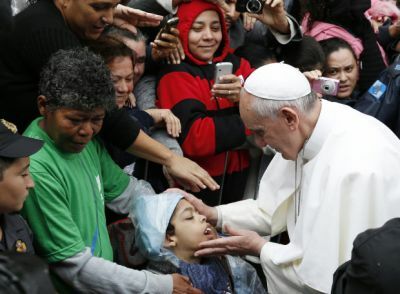 Afterward, Pope Francis walked through the city’s streets, apparently indifferent to the rain, stopping often to greet many of those crowding tightly around him. Loud cheers accompanied him as residents reached out for his hand or to take his photo with their cell phones. At one point, the pope entered a resident’s house, festooned with balloons in the yellow and white colors of the Vatican flag. He spent 15 minutes inside and, according to the Vatican spokesman, he greeted more than 20 people of all ages packed into a small room. 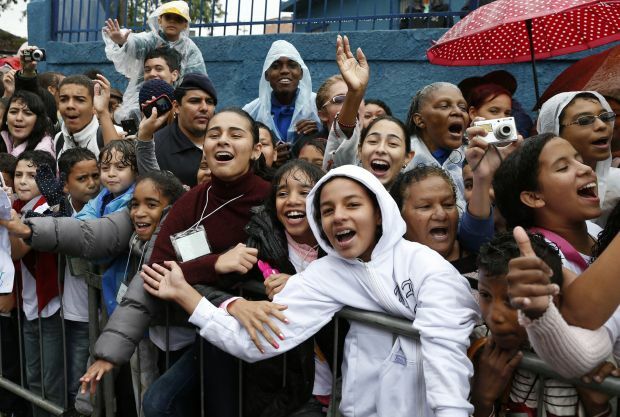 After more than half an hour, the pope stepped onto a stage overlooking the neighborhood soccer field, where more than 20,000 people had gathered from Varginha and surrounding neighborhoods. One resident, Rangler dos Santos Irineu, formally greeted the pope with a speech in which he noted that Varginha had received new street lighting and newly paved roads in the weeks prior to the papal visit. Turning to address a wider audience, the pope urged the world’s wealthy, public officials and “all people of good will who are working for social justice” to “never tire of working for a more just world” and greater equality. But the pope added that giving “bread to the hungry,” while required by justice, is not enough for human happiness. “There is neither real promotion of the common good nor real human development when there is ignorance of the fundamental pillars that govern a nation, its nonmaterial goods,” he said. Contributing to this story was Cindy Wooden.